You are here: Home » Life Issues & Bioethics » Contraception & Abortion » Will New Saint Bring New Allies to UN Abortion Debates? Mother Teresa’s canonization in Rome reverberated at an event in UN headquarters where top diplomats praised the saint as the very essence of the UN’s mission even if they had opposed her message on life and family issues in the past. His remarks were part of videos shown last week, which included the saint’s condemnation of abortion as “direct killing of a child” and “the greatest destroyer of peace.” For those following the abortion debate at the UN, it was a remarkable juxtaposition of the saint’s clear condemnation of abortion and unmitigated praise from countries that promote the policy. The UN event was co-sponsored by the Holy See, along with the missions of India, Italy, Albania and the Former Yugoslavian Republic of Macedonia where the saint’s birthplace now resides. 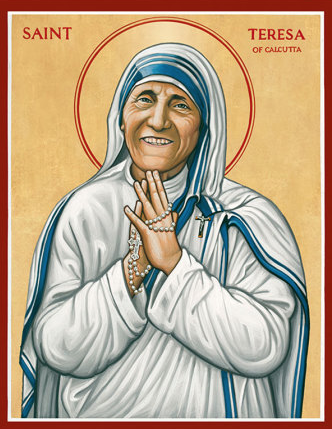 Albania’s ambassador lamented that the only country that prohibited St. Teresa and her work was the saint’s native Albania. Because of that, St. Teresa never saw her mother after leaving home for an Irish convent at the age of 18. The ambassador noted that while the communist regime is long gone, the saint lives on in the name of the airport, the capital’s main boulevard, the hospital and many other places. Albanians made a particularly strong showing at the canonization in Rome, filling entire sections of St. Peter’s Square. Albanian priests and religious sisters waved large red Albanian flags and remained cheerful throughout the hours-long ceremony and the relentless heat that sent many to the makeshift infirmary. Many of the 100,000 pilgrims spent the night on the street and formed long lines outside the tight security stations hours before the gates opened at 7am for the 10 am event. The diversity of the crowds in Rome and the audience at the UN event demonstrates the common ground St. Teresa was able to help people find during her lifetime. While some pit a “peace and justice” focus against a “pro-life” emphasis at the UN and within the Catholic Church, the saint never allowed such a dichotomy. St. Teresa always included the unborn child when she spoke of the “poorest of the poor.” In Rome, her pro-life message was seamlessly woven into the Pope’s “Year of Mercy” which among other things has focused on bringing fallen-away Catholics who disagree with Church teachings back into the fold. At the UN, the organizers of the event honoring her made the same point when they included clips of her pro-life speeches under the theme “leave no one behind.” The phrase is one of the themes used by the UN and its agencies in the new set of development goals and in the recent World Humanitarian Summit. It remains to be seen whether those countries who organized the event will put the message into practice in their foreign policy or in UN debates. One UN agency has invoked the saint to fight against Catholic Church teaching that she defended during her lifetime. The Office of the High Commissioner for Human Rights uses images of St. Teresa to promote homosexuality in its “Free and Equal” campaign.